Deric's MindBlog: Neural predictors of attitude changes. When our actions conflict with our prior attitudes, we often change our attitudes to be more consistent with our actions. This phenomenon, known as cognitive dissonance, is considered to be one of the most influential theories in psychology. However, the neural basis of this phenomenon is unknown. Using a Solomon four-group design, we scanned participants with functional MRI while they argued that the uncomfortable scanner environment was nevertheless a pleasant experience. 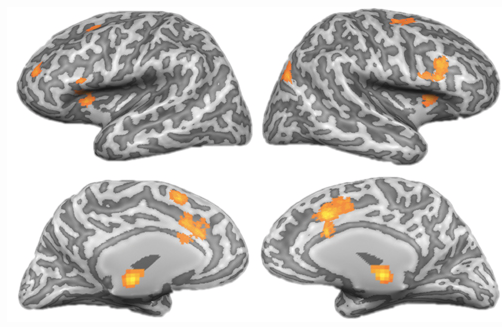 We found that cognitive dissonance engaged the dorsal anterior cingulate cortex and anterior insula; furthermore, we found that the activation of these regions tightly predicted participants' subsequent attitude change. These effects were not observed in a control group. Our findings elucidate the neural representation of cognitive dissonance, and support the role of the anterior cingulate cortex in detecting cognitive conflict and the neural prediction of attitude change.